It has some of the most beautiful beaches in the world but a red tide algae bloom stretching a hundred miles from Anna Maria Island down to Fort Myers on the Westcoast of Florida is turning into an ecological disaster as tons of dead fish are being shovelled from beaches. Dead fish are now washing ashore on Anna Maria Island after the red tide bloom drifted slightly north over the weekend. Meanwhile, crews in Sarasota County say they removed several tons of dead fish over the last two days alone. Red tide is an algae bloom that depletes oxygen in the water, killing marine life from fish to manatees to turtles. The organism can also cause respiratory problems and eye irritation in humans. 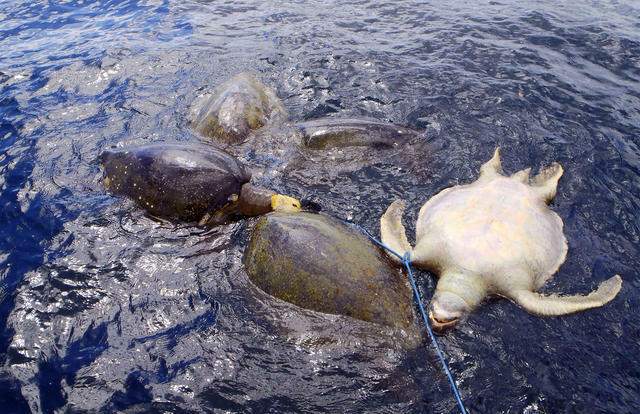 The toxic bloom has killed tons of fish, dolphins, turtles, and manatees – and now it’s taking a toll on birds as the scavengers are eating the diseased fish. According to Fox13.com, the city has set up special dumpsters just for red tide waste along the beach that will be emptied regularly "to keep the smell to a minimum." The bloom has been largely stagnant off southern Sarasota County for the last several months, but it has spread north over the last week or so, reaching Longboat Pass on Friday and then Anna Maria Island over the weekend. Fish removal efforts continue there today. Inmates with the Offender Work Program joined county employees using front-end loaders to remove the carcasses of everything from mullet to snook to grouper from the normally pristine beaches. Further south in Sarasota, officials say 12 tons of dead fish were removed from Lido Beach over the weekend, along with several more tons from Siesta and Turtle beaches. That’s in addition to the seven tons pulled last week. persistent red tide bloom continues to send dead fish and marine mammals washing up on the shores of Southwest Florida. Now, one local county says crews there have removed more than 66 tons of dead fish from beaches in just the last few days.